To my Italian’s Panettone is like a box of chocolates would be to my family, you bring it when your told not to bring anything. If you have never heard of this before which I hadn’t either, to give you the run down. The bready cake comes in a square tall box and was first made in the region of Milan, Italy. 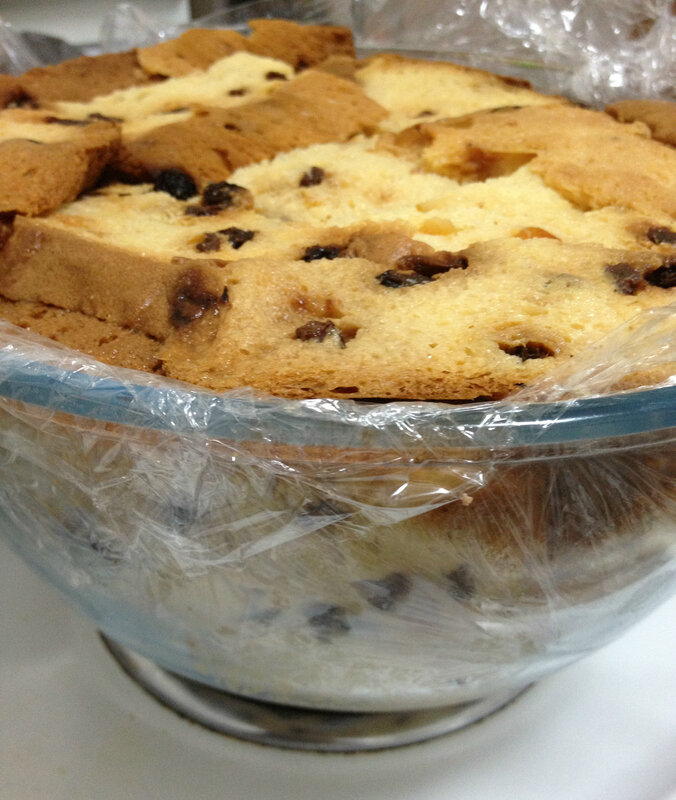 It is usually eaten at Christmas and is considered as a poor man’s dessert because it was originally made from leftover bread and dried fruit. It is a light, soft, shreddy, rich, flavorful bread, speckled with candied orange, citron, raisins and lemon zest. The cake is usually eaten with coffee or dipped in a sweet dessert wine called Vin Santo (holy wine) after dinner. Recently Mamma had been given quite a few from friends, she was getting bothered by them being in her cupboard. Not because they were going to go off, they last forever. But because she didn’t have any other use for them apart from eating with coffee and the family were getting a little bit tired of having it. I told Mamma I would take one home as I wasn’t sick of them yet she was very happy to part with it. 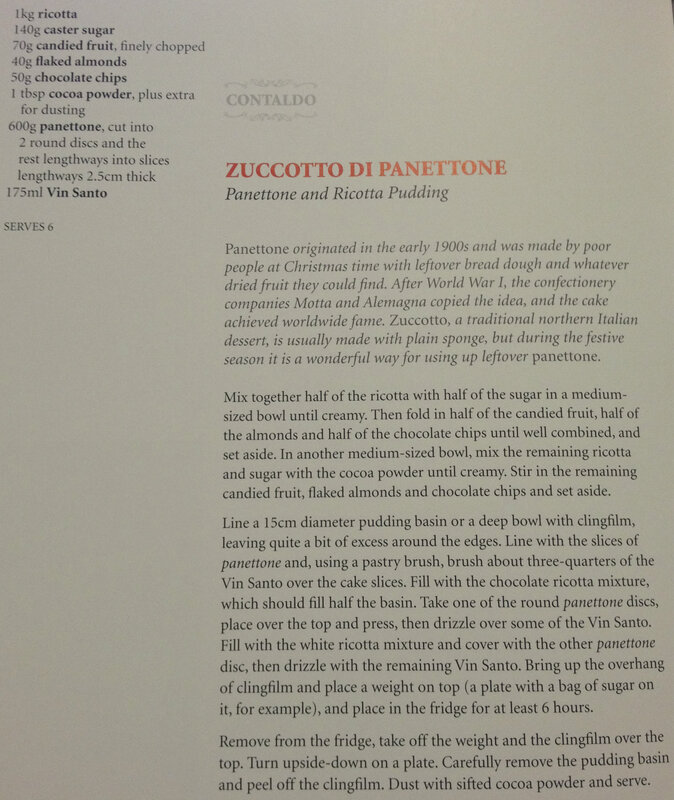 I happened to come across a recipe in one of my favourite Italian cook books ‘Two Greedy Italians’ by Antonio Carluccio and Gennaro Contaldo and they use a whole Panettone in a dessert. So I attempted to make it for family dinner next week. * Make it the night before I find it sets better and all the Vin Santo has absorbed into the bread. *Turn it out of the bowl just before you are ready to eat it. After a while out of the bowl it starts to lose its form. 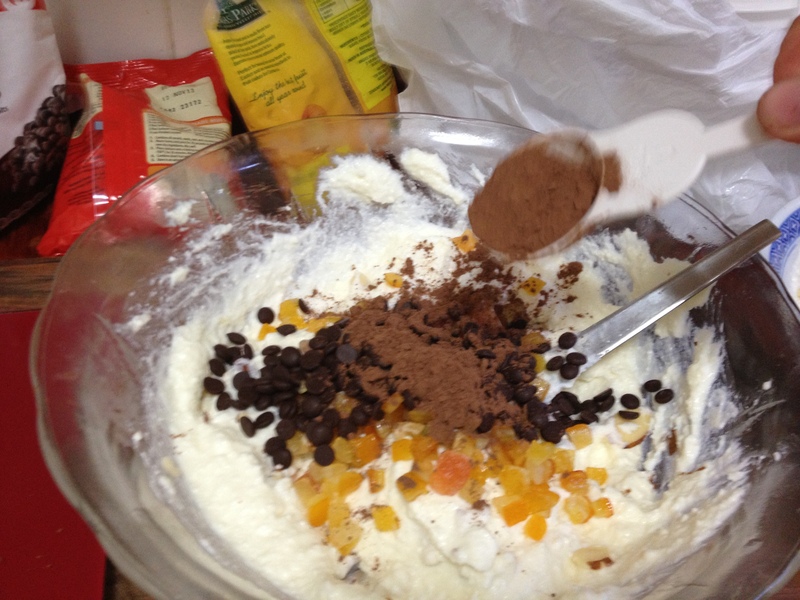 *For the candied fruit I used dried pawpaw and candied citrus. * I added a little extra (30g each) choc chips and almonds to the ricotta mix as there seemed to little for the amount of ricotta. Mamma and the family devoured the pudding, you know you have made something good when u barely get a chance to get a piece. 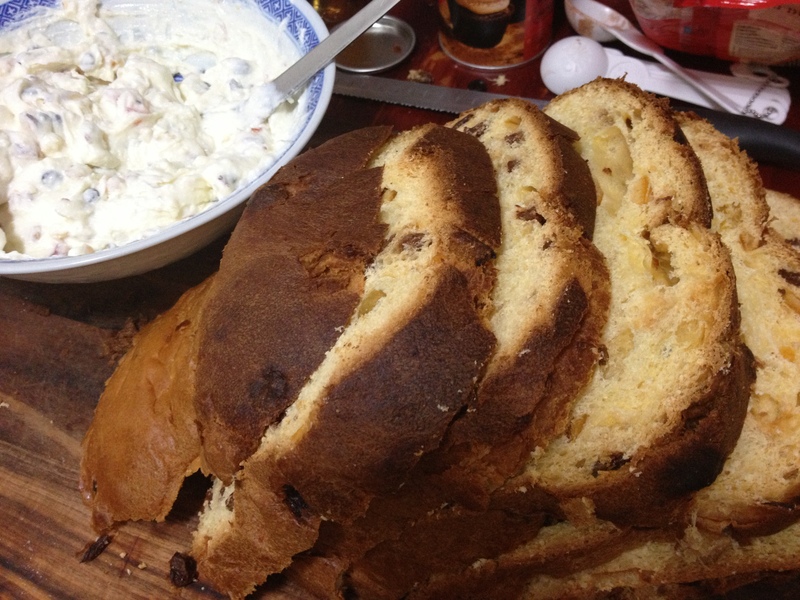 They were very impressed with the dish so much, that Mamma has given me more Panettone so I can make it again and bring it to the next family function. 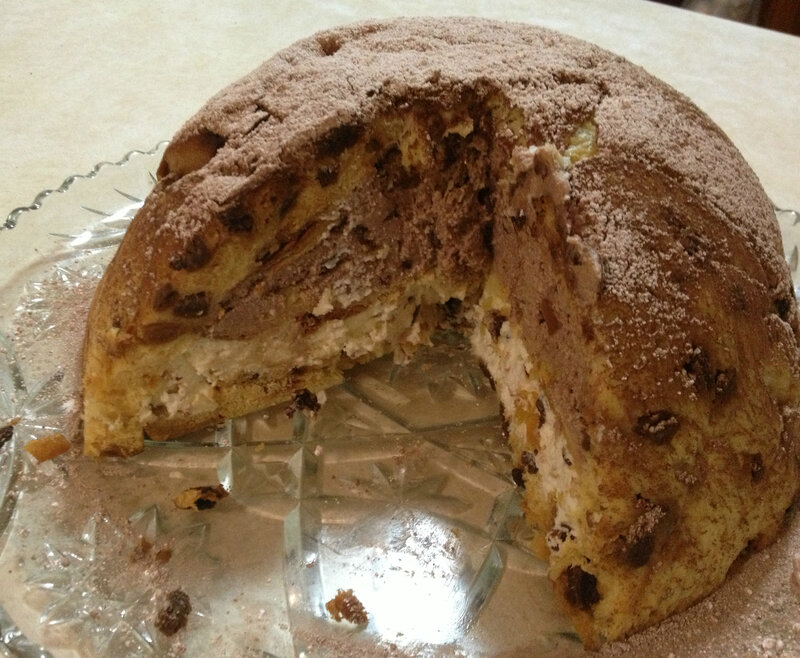 This entry was posted in Family Dinner, Recipe, Voilà and tagged cake, dessert, familydinner, Panettone, Rec, Ricotta, Two Greedy Italians by wordofthenonna. Bookmark the permalink. My ricotta was almost solid so I had to add milk to make the consistency more like that in the photo. It’s in the fridge right now and we will try it out tomorrow, but hope I didn’t stuff up! I have had the same problem before. Milk was a good idea to make the ideal consistency. Nonna recommends to shop around for a “fresh” ricotta. We use ‘Paesanella’ brand. This ricotta is smooth, slightly grainy, is white, moist and has a mild sweet flavor. If you live in Sydney they have a factory in Marrickville that they make it on the premises and you can buy it as they make it. The ricotta comes in a plastic mesh basket that is vacuumed sealed we use the basket as a strainer too. It turned out well for a first attempt and I enjoyed making it. I have been to the Marruckville factory many years ago with an Italian friend and will remember it in future. I bought my ricotta from the deli section in Coles and it looked like it had been in a mesh basket. My husband is enjoying it with some fresh cream on it.